1. At the command line, enter notepad test.txt. 2. Put some data in the file, save the file, and close Notepad. Step 1 will open Notepad. 3. At the command line, enter dir test.txt and note the file size. 4. At the command line, enter notepad test.txt:hidden.txt. 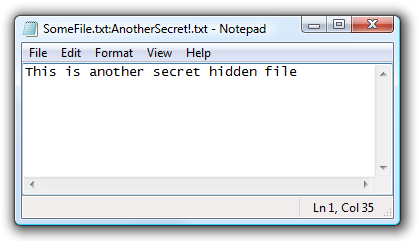 Type some text into Notepad, save the file, and close it. 5. Check the file size again (it should be the same as in step 3). 6. Open test.txt. You see only the original data. 7. Enter type test.txt:hidden.txt at the command line. A syntax error message is displayed.